What does it take for small, rural communities to go from ideas to action? Thoughtful design can support communities in using their assets for the well-being of residents, but many of the places that need it most lack access to design expertise. Since 2011, Project for Public Spaces has served as the cooperator for Citizens' Institute on Rural Design (CIRD), a leadership initiative of the National Endowment for the Arts that enhances rural communities and economies through a collaborative design process. For eight years, CIRD has worked with small communities of 50,000 residents or fewer to build capacity and turn locals' ideas into a comprehensive vision. During this time, CIRD provided 19 communities with collaborative design workshops, webinars, and other capacity-building resources. As PPS hands the program over to its new cooperators—Housing Assistance Council in partnership with buildingcommunityWORKSHOP — we wanted to take the opportunity to share some of the dynamic, cooperative strategies used by CIRD communities to address diverse rural design challenges. Draw Drawing Talent. To prepare for Nebraska Department of Transportation’s (DOT) upcoming redesign of the downtown Main Street in Valentine, NE, organizers commissioned two illustrators­—architect Jim Leggitt of Drawing Short Cuts and landscape architect Kim Wilson—to help visualize possible futures. Throughout the workshop, they created live sketches and plans, which brought to life the groups’ ideas for building facade improvements, landscaping, gateway signage, and parking configurations. While not being overly prescriptive, these full-color sketches were instrumental in generating community feedback. Engage Local Designers. At the Lima, NY workshop, which focused on creating a new vision for downtown, the Rochester Rural Community Design Center enlisted local member designers to facilitate breakout sessions with community members and civic leaders. 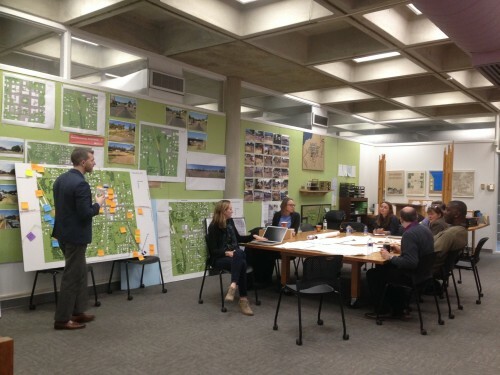 These architects, landscape architects, and professors worked with Lima residents to create an updated land use plan featuring new locations for housing and trail connections, a reconfigured Main Street, and ideas for activating the town’s municipally-owned public spaces. Plan Ahead and Have the Right Resource Team Members at the Table. 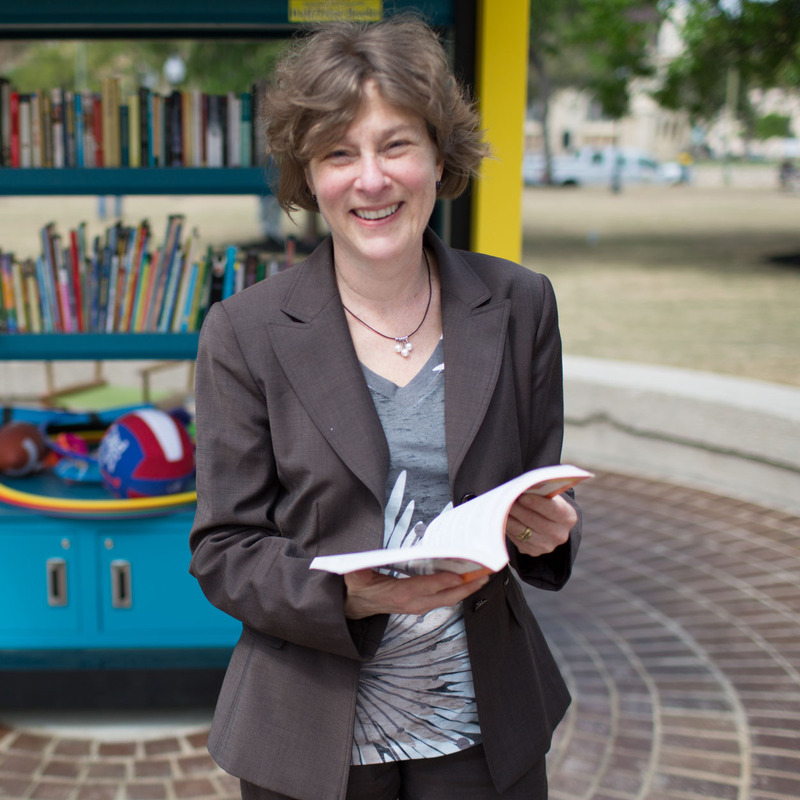 For the Thomasville, GA and Las Vegas, NM workshops, which both focused on riverside parks and river health, landscape architect Elise Cormier acquired site plans in advance of the workshops and engaged fellow resource team members before the actual workshops took place. Specialists in native plants, river health, play spaces, and green infrastructure worked together to drive a vision for MacIntyre and Gallinas River Parks that served both the community and local ecology. The parks featured plans for community gathering spaces, reintroduction of native plants, and mitigation of flooding and erosion. Have Designers Work Directly with Community Members. Kristin Stoltz, former Co-Director of M12 Collective, Emily Vogel, a professor of landscape architecture of the Rhode Island School of Design, Jesse Vogler, assistant professor at the Sam Fox School of Design and Visual Arts, and Mark Wise of KEM Studio, collaborated with residents of Alton, MO on the design of a new facility to house the Oregon County Food Producers and Artisans Co-op. They also helped the community to envision a built-out interior to meet their needs, including a huge farmhouse a table to be hand-crafted out of recycled wood to help facilitate classes, cooking demonstrations, and performances. Hire Artists as Members of the Design Team. 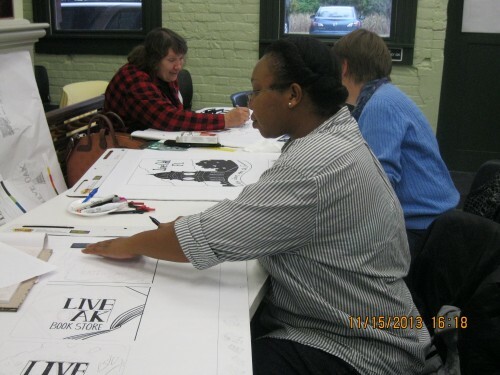 Rural LISC (Greenville, MS) hired an illustrator to capture ideas generated in the workshop sessions to graphically render words into captivating images that will be used to create the concept plan for redesigning Greenville’s retail districts. Revitalizing the once-thriving, historically African-American commercial district emerged as a key outcome of the workshop, and will be the focus of ongoing efforts by the Greater Greeneville and Rural LISC team. In Live Oak FL, four local artists transformed community-generated ideas about the City’s image, brand, assets, and aspirations into a series of “portraits” of Live Oak which were used to create new wayfinding, signage, and logos for the City. 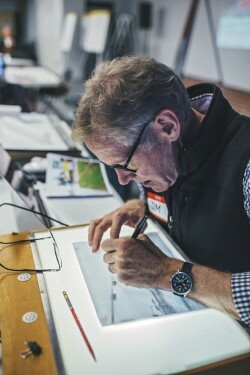 The Live Oak workshop hosts commissioned local artists to create a series of “portraits” of the City which were used to create new wayfinding, signage, and logos. Utilize Design Students and Others to Document. University planning, landscape architecture, and architecture graduate students can be strong assets. 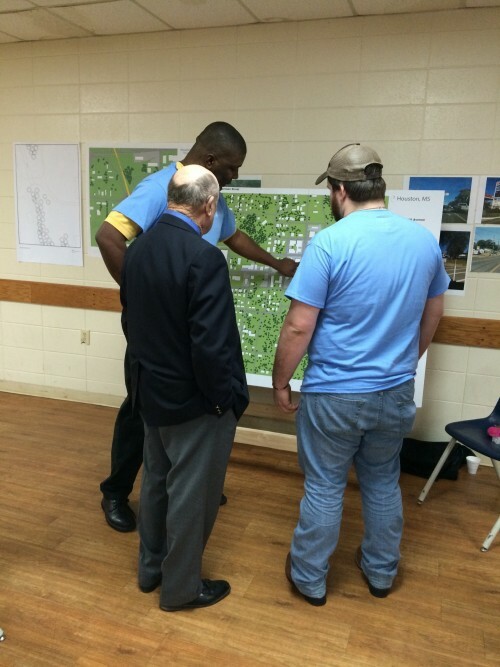 Under the guidance of Mississippi State University’s Carl Small Town Center, design students helped to illustrate concepts, capture community conversations, and take photographs for a community workshop focusing on the design of the Tanglefoot Trail in Houston, MS. In Valentine, NE, professional videographers captured the workshop proceedings in engaging ways and the videos they produced are easy to share and present to city councils and local funders. Show Up at Other Community Events. On a Friday night, workshop participants and the CIRD resource team met up with neighbors in MacIntyre Park for “Tailgate in the Park”—a community cook-out event which is held before every home team football game in Thomasville, GA. 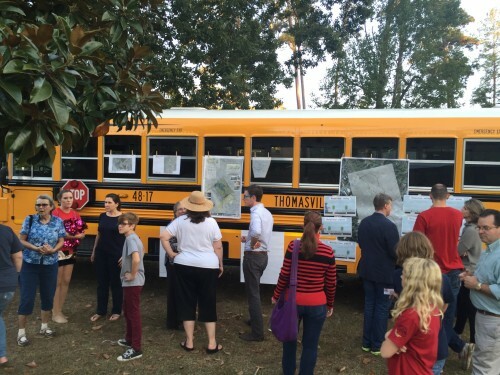 The CIRD Team turned it into a pop-up workshop, hanging sketches and drawings of the initial park master plan concepts on the side of a school bus parked in the park. Thomasville school children, who initially broached the idea of redesigning MacIntyre Park, shared their ideas with resource team members who incorporated them into the drawings right before their very eyes. “Tailgate in the Park,” a community cook-out event, was turned in a pop-up workshop (Thomasville, GA). Get People to “Build” Their Future Vision. James Rojas’ joyous “Place It!” exercises, “Build Your Favorite Childhood Memory” and “Build your Ideal Park,” set the tone for the Las Vegas, NM and Live Oak, FL workshops. These exercises, which tapped into people’s inner child through memory and creative play, encouraged an environment of openness, communality, and trust amongst a group of people with a cultural history of division. Using found objects and other building materials, participants crafted their own small-scale models to communicate their aspirations for their town’s future. Share Stories. Storytelling circles proved effective in encouraging residents from Salmon, ID to share their experiences and aspirations. Following the telling of individual stories, this group explored common themes, questions, and related information. Group storytelling helped to build personal relationships among participants and across generations, creating an opportunity for people to explore issues and concerns in a deeper, more personal way. Preserving local landmarks (the café where one gentleman met his wife), and the town’s pristine, nature surroundings (where a man had a respectful interaction with a skunk one late night on a bridge) helped the community identify how the trailhead connected to the downtown, and to realize, in fact, that Salmon, ID is where the community becomes the trailhead. 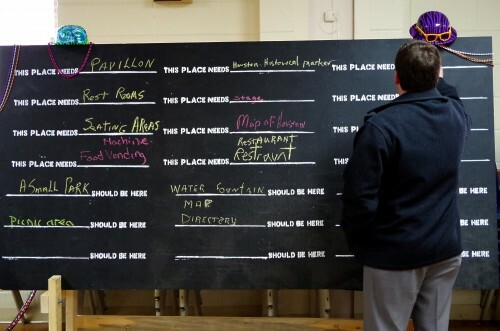 Students of Mississippi State University created a chalk blackboard for the community to submit their ideas for "What This Place Needs," and "What Should be Here." Solicit Ideas through Art. The Carl Small Town Center and the students of Mississippi State University came up with innovative idea of gathering tools including a variation of Candy Chang’s “Before I Die” board to solicit quick responses from the community about their vision and dreams for Houston, MS.
Resource Team Member, Keith Holt, Southeast Regional Director, Wisconsin Bicycle Federation guides participants in a “map your walking route” exercise (Houston, MS). Hire Artists to Celebrate Local Culture. Organizers in Red Lodge, MT scheduled multiple small live music performances throughout their two-day workshop. The inspiring tone the performers brought to the room reinforced a sense of shared value and pride in the community, and ignited their desire for an arts-based community center to support multiple types of creative expression. 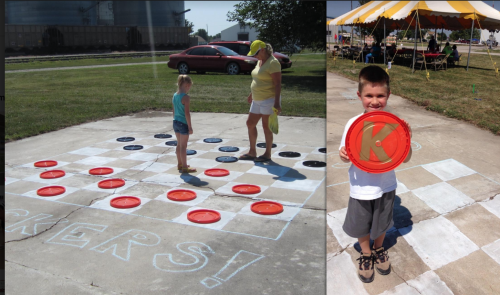 Orange and black bucket lids were used for checkers with "K" painted on one side to signify Kings (Hallam, NE). Don’t be Afraid to Experiment. After their CIRD workshop, the Lincoln-Lancaster County Planning Department selected proposals from the Village of Hallam to implement some “Lighter, Quicker, Cheaper” experiments. Hallam’s proposal included a long-range vision to use funding to improve the pedestrian streetscape of its downtown. Hallam used the opportunity of their annual cultural festival to beautify their downtown and test out pedestrian streetscapes. 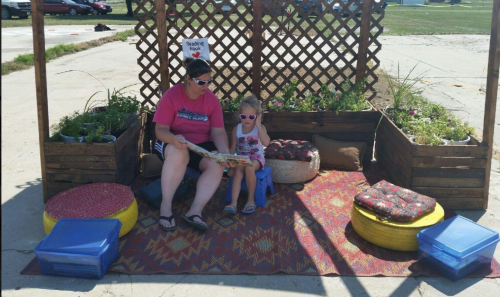 Residents painted a checkerboard on a vacant parking lot and used lids from joint compound buckets as checkers, they created a pop-up reading room, and used bales of hay to create temporary bump-outs at street intersections. A reading nook provided a comfortable place to relax and read a book. Seats were made from used tires, planters were constructed from old pallets, and books were donated from local libraries and other residents (Hallam, NE). Prototype Temporary Projects. Chimacum, WA implemented a series of temporary demonstration wayfaring and signage projects on Interdependence Day—a day dedicated to supporting arts and active transportation. This celebratory day and temporary signage prototyped a vision for the future, creating a shared sense of community and heritage among legacy residents and a new generation of landowners. Find Common Ground. The convening of federal, state, and local partners together with Tribal members in Isles de Jean Charles, LA was instrumental in finding a common ground between the local community and government. Specifically, this CIRD workshop offered many lessons for state agencies to help them understand and recognize varying cultural approaches to planning issues and ways to incorporate these approaches into government policy. The Isle de Jean Charles Band of Biloxi-Chitimacha-Choctaw Indians was able to assert their priorities for relocation, including the incorporation of a tribal center, garden plots, and ceremonial buildings. The Tribe shared its vast knowledge with outside partners about the meaning of place, the value of holism, and the importance of respect for the natural environment, and obtained a better understanding of the state’s design development process and how they could be more deeply involved. Build on Funded Initiatives. 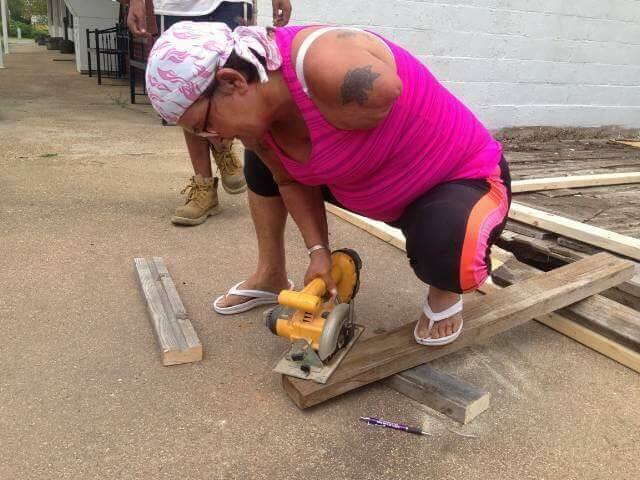 After the Akwesasne CIRD workshop, The Kanien’kéha Owenna’shón:ah Signage Project began. The project is aimed at getting community members to use the Mohawk language (Kanien’kéha) in public spaces. A key goal of the CIRD workshop was to incorporate elements of Mohawk culture more explicitly in the built environment, and the CIRD workshop was able to capitalize on momentum of a recently awarded $2 million grant to develop a cultural tourism initiative in Akwesasne. New hires supported through that grant have begun implementing the vision of the CIRD workshop through new built signage and projects that promote cultural heritage and tourism. Partner Locally. Strengthen ND led the workshop in Tuttle ND to establish the Tuttle Rural Innovation Center. With a focus on building momentum for a regional food hub and cultural center, Strengthen ND coordinated with local partners to keep momentum going beyond the workshop by planning a series of follow up activities. They are hosting another public workshop in May, as well as a community event called the “Food Hub Huddle Up.” Both activities enable local partners to organize around a shared goal. Adopt a Resolution that Others Can Get Behind. At the workshop held in Somerset, KY participants crafted a formal resolution to support art as an economic driver. The resolution officially recognized the value and potential of arts and cultural resources in contributing to Kentucky’s economic growth, and outlined goals and action items for supporting arts and culture. The resolution was subsequently adopted by the Kentucky Tourism, Arts, and Heritage Cabinet. Create a Project Website. To encourage municipal and civic leaders from the 12 villages surrounding Lincoln, NE to participate in the CIRD workshop, the Lincoln-Lancaster County NE Planning Department created a website, “My Lancaster County,” which invited youth from those communities to upload photos of their favorite community places, including background information, history, and points of interest. The website enabled the community to generate momentum, conduct outreach, and track progress. Seek Dollars Locally. Local utility company, Heartland Electric, paid to hire the lead facilitator for the Valentine, NE workshop and has pledged additional support for elements of the Main Street reconstruction project that fall outside of the NDOT budget. The workshop hosts in Lima, NY took Perry, NY Mayor Rick Hauser’s suggestion to “put your money where your house is” and raised $10,000 from local to buy a vacant property on Main Street and reuse it for a public benefit purpose. 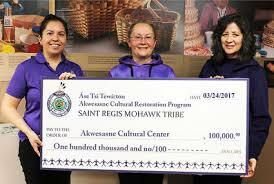 Sue Ellen Herne, Mohawk Tribe, Bear Clan, Akwesasne Museum Program Coordinator, holds up a check from the St. Regis Mohawk Tribal Cultural Restoration Program for the Akwesasne Cultural Center. Find Funding to Build Organizational Capacity. Following the CIRD workshop, the Akwesasne team secured $49,000 in Canadian government funding to help the Mohawk Council Akwesasne Community Support Program train community members in advanced customer service skills. This was identified as a key opportunity for driving cultural tourism, educating visitors about Mohawk culture, and encouraging them to visit cultural centers beyond the Casino, such as the Traveling College. Pool Funding from Various Sources. Since their 2014 workshop, Franklin, NH has attracted over $1.5 million in public and private resources to help forward their community’s design vision. Funding sources are discreet but work together to achieve the big picture. A $50,000 from USDA Rural Business Enterprise Grant enabled the city to hire a downtown coordinator; $500,000 in Community Development Block Grants supported a redevelopment project for an underutilized mill to develop units for seniors and individuals that income qualify; and $200,000 from the Land and Water Conservation Fund was matched with $200,000 organized by Mill City Park and Franklin Savings Bank, a downtown institution. 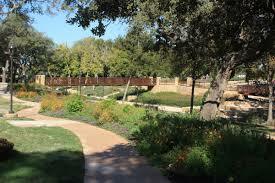 A section of the completed Walnut Creek Trail (Photo Credits: City of Seguin, TX; Marika Fine Arts). Solicit Financial and Political Support. 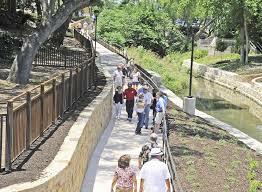 Funded by a $1.8 million Texas Department of Transportation grant, the Walnut Springs Trail—the focus of a workshop in Seguin, TX in 2013—was completed and unveiled in 2016. The trail links Walnut Springs Park to downtown Seguin, and runs past a number of historic structures and sites with public use potential. It also provides a safe bicycling route for workers from a predominantly Latino Community (most of whom don’t own a car) to get to work, as well as a place for children to walk and play. Get Future Funders to Buy into Your Vision. The City of Limon, CO secured commitment from 27 state agency and organization representatives in attendance at their workshop to act as a state resource team and funding group. This group included the Colorado State Departments of Transportation, Local Affairs, the Office of Economic Development and International Trade, and U.S. Department of Agriculture Rural Development. The state funding team shared information on funding sources for trail construction, signage design and implementation, and programming. 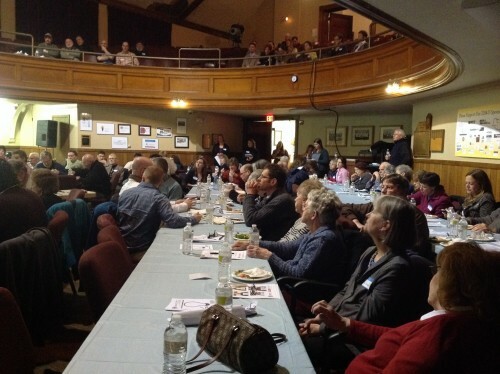 The workshop in Franklin NH was held in the former Opera House, which now serves as the City Hall. Find the Venue that’s Right for You. The venues where CIRD workshops took place were as varied as the design challenges faced by the communities. We held workshops in a vacant historic train station in Live Oak, FL, which may see the return of Amtrak service, and other venues included the town hall (Houston, MS); historic theaters (Greenville, MS); a public school converted to an art center (Thomasville, GA); a university (Las Vegas, NM); cultural centers (Akwesasne Territory); a public library (Isle de Jean Charles, Houma, LA); a public school being transformed into a rural innovation center (Tuttle, ND) and a multicultural arts center (Red Lodge, MT); a Hispanic cultural center (Seguin, TX); a nature center (Lancaster County, NE); a barn (Salmon, ID); a vacant Main Street storefront (Valentine, NE); and churches (Lima, NY, Alton, MO); and an agricultural research center (Somerset, KY). 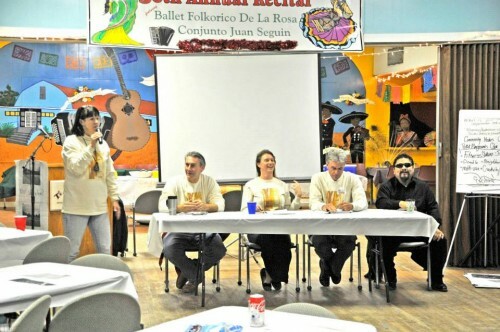 The workshop in Seguin TX was hosted at the Teatro De Artes De Juan Seguin Cultural Center. Get Creative with Lodging. Many of our host communities lacked motels or hotels and our workshop coordinators were concerned about finding places to stay for CIRD staff, resource team members, and out of town participants. Here are some ideas you may consider when hosting visitors to your community: Hunting cabins in the off season (Alton, MO); religious retreats (Live Oak, FL); B&Bs which have the added benefit of supporting a local business (Seguin, TX; Franklin, NH; Red Lodge, MT; Houston, MO); locally-owned and operated hotels (Valentine, NE and Tuttle, ND); and cultural event venues (Akwesasne Territory). A few times we were able to stay in the city’s most historic hotel (Las Vegas NM; Red Lodge, MT), and sometimes we were lucky enough to be invited by our workshop hosts and their friends to stay in private homes. 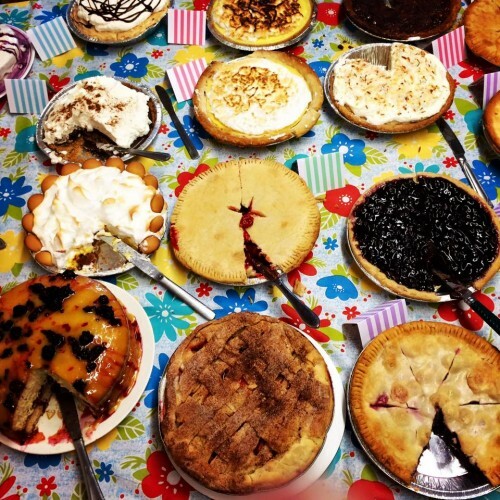 Workshop refreshments were often homemade (Alton, MO). Feature Local Food. Local food was truly a highlight of every workshop, especially when prepared by local restaurants, food entrepreneurs or local residents themselves, and it gave us all the chance to savor, share, and celebrate indigenous, local culture. The Chili cook-off in Alton, MO got people to come down to the church to see the unveiling of the designs for the new Food Producers and Artisans Coop building. The venison curry and moose-filled dumplings featured at our workshop in Akwesasne were the creation of a culinary artist from the St. Regis-Mohawk tribe. The crab boil at Deputy Chief Boyo Billiot’s house near Isles de Jean Charles, LA had us rolling up our sleeves and licking our fingers. If your Sheriff has a mind to, having him fry up a mess of catfish at the local Moose Lodge next to a bonfire with fiddle music playing might just get him re-elected (Alton MO). It has been an inspiration to experience first-hand the incredible energy of rural America in their pursuit of their future! Onward! What is Good Rural Design?